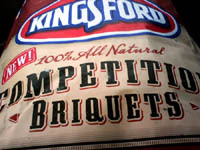 Last weekend I finally got my hands on a bag of the new Kingsford Competition Briquets. 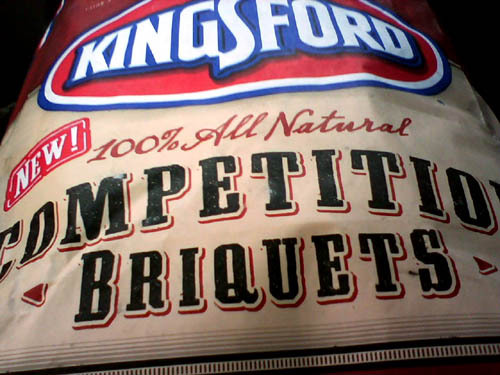 As a quick aside, am I alone in thinking it should be "briquettes"? I must be right because even Wikipedia agrees with me. In short, I was really impressed. I used them to cook a hot & fast brisket for a church Super Bowl party. As I originally suspected, they smelled very "Rancher-esque". They burned very evenly with minimal ash. In fact, after a six-hour 350º cook I had nearly half of the 12-pound bag left in my cooker. I realize that these are a little pricey, but I really like them so far. One cook is by no means a good test, but I'll keep putting them through their paces. The venerable Greg Rempe of TheBBQCentral.com and BBQ Central radio fame had Eric Schuetzler, senior scientist for Kingsford product and process development, on his show tonight. It was a great interview that yielded a ton of interesting information. Good on ya, Greg! tpack - In all honesty, I have no idea. I do know that their new "Professional Briquets" are just their former "Competition Briquets" re-branded.